Albany is an old city, and it has a lot of old buildings. For all sorts of reasons, many of these old buildings are missing their architectural neighbors. And the resulting effect is that sometimes buildings appear like a fragment of conversation heard without context. But it only looks like that way because the buildings around it are missing. And that's why we were delighted to see the above illustration today. 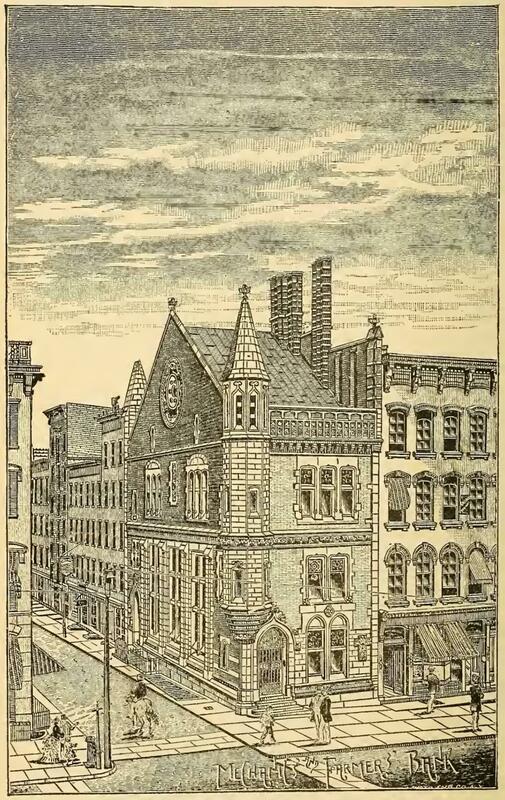 From the illustration you can see how the building, designed by Russell Sturgis, once served as the corner piece of two intersecting rows of downtown buildings. It still stands out as a beauty, but it makes a more sense. "Those who apply for this institution are generally mechanics and middling traders, whose wealth is the fruit of their honest industry, and whose talents and integrity in their pursuits entitle them to the patronage of an enlightened legislature. * * * To our fellow mechanics then, of the city of Albany, we recommend a cordial union in support of an institution calculated for their good, and for the fairness and liberality of whose operations they have a sufficient pledge in the integrity of those with whom the plan originated, who have brought it to its present state of maturity, and have been the first to step forward and claim for it the sanction of the legislature. It is no child of party, no offspring of monopolizing speculation, but has its origin solely in a regard for the common good of those who if they did not protect their own rights, will look in vain for their protection from any other source." They could sure turn a phrase in the 1800's. There are other consequences when a building loses its neighbor. The next structure on State between Mechanics and Farmers and Broadway is 41 State, a 60s era office building that was hideously disfigured when the adjoining buildings it was built next to came down. The exposed surfaces, absent of windows or decorative facing, make for one of downtown's ugliest sights. Nobody was ever supposed to see those parts of the building, and apparently, nothing has aver been done to improve its appearance.